"Des Moines Area Community College (DMACC) Criminal Justice student Sydnee Redman of Osceola portrays a police officer interviewing one of the injured, played by nursing student Erika Bailey of Altoona, in a crash simulation held on the DMACC Ankeny Campus …"
"As part of Des Moines Area Community College’s celebration of the Literary Arts Week, Iowa State University Instructors Burmeister and Dawson read their poetry, short stories and novels at DMACC’s Carroll campus April 9. Both instructors are published writers who teach English at Iowa State. …"
"The Des Moines Area Community College (DMACC) recently received two donated vehicles for their Diesel Technology Program. …"
"Des Moines Area Community College (DMACC) and the Carroll Public Library are teaming up this weekend to celebrate Earth Day. On Saturday, April 20, area residents are invited to DMACC’s Carroll Campus on Grant Road from 10 a.m. to 11:30 a.m. for a variety of fun, nature-related activities. …"
"The Newton DMACC Conference Center was buzzing with activity Tuesday afternoon as students, staff and faculty came together to help those in need. More than 100 volunteers gathered at the Newton campus, donning plastic gloves and hairnets to help with the Meals from the Heartland packaging event. In honor of Newton campus’ 25th anniversary, the goal was to package 25,000 meals. …"
"ANKENY - Students at DMACC put their teamwork to the test on Monday during a disaster simulation. It involved students from all across the school. "We are doing our spring mass casualty multi-campus, multi-program simulation experience," said Melody Bethards with DMACC. …"
"Now, group members are working to identify and assess specific areas for prioritized projects and enhancements. These will address network connectivity and support active transportation between key points of interest, including Legacy Plaza, the Des Moines Area Community College campus, downtown, schools, and recreational spaces. 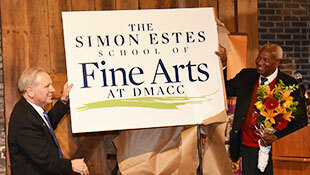 …"
"DMACC President and CEO Rob Denson announced today the new Simon Estes School of Fine Arts at DMACC. Initial plans call for the music and theater programs to be expanded and housed under the new fine arts school. But, eventually other programs will be added. …"
"The Phi Beta Lambda (PBL) student business organization at Des Moines Area Community College (DMACC) recently participated in the State Leadership Conference held in Coralville on March 29 and 30. The students, accompanied by their advisers Christine Moon, Susan McCoy, Tasha Mullihan, Russ Holmes and Joe Hanson, competed against other Iowa college students in various business related events, receiving both individual and chapter awards. …"
"On March 8, a total of 21 high school students signed a certificate of intent to attend DMACC during the college’s first-ever Automotive Signing Day. …"
"Are you looking for something fun to do with your kids? Check out the Boone Family STEM (Science, Technology, Engineering and Math) Festival from 9 a.m. to noon, on Saturday, April 13 at the DMACC Boone Campus at 1125 Hancock Drive in Boone. This free event is open to families with kids of all ages to experience hands-on STEM activities. …"
"Four students were honored Saturday at a banquet at the Hotel Pattee as the second class to graduate from the Des Moines Area Community College VanKirk Career Academy and Tyson Fresh Meats Inc. partnership called the Industrial Maintenance One-Plus-Two Training Program. …"
"The banquet is hosted by the Ames Tribune in partnership with Des Moines Area Community College and sponsored by Fareway Meat and Grocery and Ames Ford Lincoln. …"
"The event, like others from the ‘Celebration of Literary Arts’ program were free-of-charge to the public and drew a crowd of DMACC students and Boone locals to the DMACC Auditorium eager to hear words from literary professionals John Domini and Lettie Prell. …"
"High wind? No problem — at least for the members of the DMACC women's golf team who hit this perfectly synchronized four-person putt while visiting the Green Hills Golf Course in Chillicothe, Missouri. …"
"Softball America has named former Des Moines Area Community College (DMACC) All-American Molly Jacobsen a Transfer of the Year. Jacobsen, a junior at the University of Mississippi …"
"That’s why Shurtape, a Hickory, N.C.- based manufacturer and marketer of pressure-sensitive tapes, introduced its Mission: HVAC, Educating for Success program in 2015 – with the goal of arming students with the money and hands-on experience they need to succeed in the HVAC field. Now celebrating its fifth year, Shurtape is proud to introduce this year’s three Mission: HVAC students: · Michael Clemons – Student, Des Moines Area Community College (Des Moines, Iowa): Michael loves being hands-on, so the HVAC industry is perfect for him. He is intrigued by the growing industry and is excited to gain even more HVAC experience. …"
"He learned carpentry skills from his father and did carpentry, finish work and built furniture as a hobby until he took a basic woodcarving class at Des Moines Area Community College in 1982. He was hooked. …"
"Des Moines Area Community College is bringing awareness to different rights and issues when it comes to crime victims. During the week of April 8th, the community college participates for a second year in National Crime Victims' Rights Week. …"
"The coalition called “Power Up Iowa” was announced at Des Moines Area Community College, where vice president Scott Ocken oversees the program that trains people to work on wind turbines. …"
"DMACC has announced a variety of new program offerings for fall 2019, bringing the college’s total offerings to more than 230 diplomas, certificates and technical program awards, as well as liberal arts transfer degrees and pre-professional programs. …"
"DMACC diesel technology student, Bill White of Slater, sets the overhead on a Detroit 60 Series engine during a class on the DMACC Ankeny Campus. …"
"Across the Midwest and beyond, Civil Engineering Technicians are in high demand and there aren’t enough people to fill available career opportunities. With nearly 20 years as an instructor and over 10 in the industry, Renee White, Civil Engineering Technology (CET) Instructor and Group Leader for Des Moines Area Community College (DMACC) knows the industry well and is floored by the demand. …"
"This is LaValle's 18th year attending the event that's dear to his heart with a team of culinary representatives from Des Moines, but it's the 35th year for the chef exchange between the Association of Cooks of the Loire and the kitchen department of DMACC. …"
"An average playwriting class at DMACC became a special event Tuesday when comedian, writer and actor Bob Odenkirk dropped in remotely to discuss writing, show business and even offered a few Iowa Cubs references. …"
"Des Moines Area Community College’s (DMACC’s) 17th annual Celebration of the Literary Arts will be April 8-10 with classroom visits to all six DMACC campuses by area writers and literary instructors. …"
"Aspiring writers got to chat with a Hollywood celebrity today. The celebrity has appeared in hits such as Breaking Bad and Better Call Saul. He gave advice for what makes a successful writer in Hollywood. …"
"Biniaz will also be speaking this week at the campuses Des Moines Area Community College sites in Ankeny, Boone and Urban campus in Des Moines with her presentation Second Chance: My Story. …"
"After graduating from Woodbury, Fritze went to Des Moines Area Community College (DMACC) in Boone, Iowa, to play a couple years of junior college baseball. At DMACC, he was the No. 1 starting pitcher and was able to develop his skills at a high level. "While I was at DMACC, we were nationally ranked and played against competitive teams every game," Fritze said. "That helped us, as players, prepare ourselves to the best of our abilities because each game was important and against a highly-ranked team." …"
"The program, called Camp Kamala, will accept applications from students and young adults until April 13; the sessions will take place April 16-18 at the University of Iowa, Iowa State, University of Northern Iowa, Drake, and Des Moines Area Community College. …"
"One of the last survivors of the Holocaust will visit three DMACC campuses and describe the horror she personally experienced during her childhood. …"
"In early March, the Iowa Pork Producers Association (IPPA) hosted the Student Taste of Elegance at the Iowa Culinary Institute on the Des Moines Area Community College campus in Ankeny. Eleven teams from five different colleges and universities competed in the contest. …"
"Eleven interns from the Des Moines Area Community College, Drake University, Grand View University, and Iowa State University will learn first-hand both the public and private side of operating an international non-profit organization and increase their understanding of the international fight against hunger, malnutrition, and poverty. …"
"A total of 21 students each signed a certificate of intent to attend Des Moines Area Community College (DMACC) in a special ceremony for the College’s first ever Automotive Signing Day. …"
"“I didn’t think Iowa State was ever going to accept me off the street, with no money to put up, and me starting from scratch in terms of education,” Johnson said. “But that’s what motivated me. I had friends encouraging me to just try, and I knew if I didn’t give a shot, I may not ever turn my life around.” The external and internal motivation coupled with his recovery from alcoholism fueled Johnson’s pursuit of an education. In the ensuing years, Johnson would go online and teach himself algebra and geometry and study for hours on end, absorbing everything he could. The months of studying paid off when Johnson passed the High School Equivalency Test (HiSET) at Des Moines Area Community College and earned a acceptance letter to Iowa State in October 2014. …"
"Eleven teams from five different colleges and universities recently put their culinary skills to the test during the Iowa Pork Producers Association's Student Taste of Elegance. The event was held at the Iowa Culinary Institute on the Des Moines Area Community College campus in Ankeny. …"
"“There’s a lot of good energy,” Superintendent Clark Wicks said of meetings between the school, the City of Perry, Perry Economic Development and Des Moines Area Community College. Morman said they are working with DMACC about the possibility of having the construction class be a dual credit class. …"
"The career day was sponsored by Des Moines Area Community College Perry VanKirk Career Academy and around 30 students from surrounding …"
"Des Moines Area Community College will have armed security officers patrolling its central Iowa campuses this fall. The community college made the …"
"ANKENY - It's all in the name of prevention. That's what Des Moines Area Community College officials are saying tonight about their proposed plan to …"
"Risner said using DMACC for concurrent enrollment is beneficial, not only for students in pathways, but for the cost of school districts to offer the …"
"Following Department of Labor guidelines and working with DMACC, Miller currently has two employees working their way through the CNC Operator …"
"Whatever your education or career goals, DMACC can be a great place to start …"
"July will mark the 50th anniversary of what’s considered humankind’s greatest scientific achievement, landing a man on the moon. To honor the landmark, Des Moines Area Community College is bringing in three Apollo astronauts to speak in a single panel this week. …"
"Des Moines Area Community College (DMACC) is celebrating ciWeek, or Celebrate! Innovation Week, and the college’s Carroll campus joined in by welcoming former astronaut, Al Worden, to speak. …"
"The theme for CiWeek 10 is “Small Steps to Giant Leaps." It is referencing the 50th anniversary of the first moon landing. Chief Administration Officer West Des Moines DMACC Anthony Paustian said the event-filled week is celebrating all types of accomplishments. …"
He inspired the movie 'Chef.' Now he's traveling to Iowa to give cooking demonstrations at DMACC. "A celebrity chef known for helping inspire the Jon Favreau movie "Chef" in 2014 will make his way to DMACC to give a cooking demonstration. …"
"Moreover, he has been a professor at such universities as the Des Moines Area Community College and Wartburg College, among others. …"
FREE ciWeek to include a panel of Apollo astronauts! "Tony Paustian with the DMACC ciWeek (Celebrate Innovation Week) joined Van and Bonnie in the studio to talk about the FREE event at the DMACC West Campus at 5959 Grand Avenue in West Des Moines! Randi Zuckerberg (Mark Zukerberg's sister - who invented Facebook Live), Dr. James Hansen (author and movie co-producer of "First Man"), Roy Choi (Celebrity Chef), Jerry Greenfield (co-founder of Ben & Jerry's Ice Cream), a panel of Apollo Astronauts and many more will be speaking! Get all the information you need at www.ciWeekExperience.com. You can hear the entire interview with Tony here... …"
"More than 100 student from Carroll, Ar-We-Va and Glidden Ralston High Schools visited the Des Moines Area Community College (DMACC) Carroll Campus Tuesday to participate in Career Discovery Days. Students were split up into seven career pathways and toured …"
"The Iowa governor’s “Future Ready” initiative includes a higher-education credential for 70% of all state residents by 2025, compared to the current 58%. Des Moines Area Community College President Rob Denson says too many Iowans still don’t access the educational opportunities in their own backyard. …"
"A once-in-a-lifetime experience will be coming to the Des Moines Area Community College (DMACC) Carroll Campus on Monday, March 4 with a special presentation from astronaut, Al Worden. Worden was the Apollo 15 Command Module Pilot from July 26 to Aug. 7, 1971. He is a world-record-holding astronaut, having completed the …"
"Indeed, young professionals in town agree. Teresa Friesen, 32, an instructor of human services, sociology and psychology for the Des Moines Area Community College campus in Carroll, said the center is one of the reasons why she and her husband Corey, a physical therapist, choose to live there. …"
"BOONE, Iowa —Three hundred wins and counting for basketball legend Steve Krafcisin. …"
"“As It Is in Heaven,” a 2004 Swedish film that was nominated for Best Foreign Language Film at the 2005 Academy Awards, will be shown at noon and again at 6 p.m. Wednesday in Room 118 at Newton DMACC. Shown in connection with DMACC’s “Year of Sweden” project …"
"“They have almost zero females in these vocational schools in Georgia,” says Curt. “They learned a lot from DMACC (Des Moines Area Community College) which now has 55 percent females.” …"
"Channel 13 invites you to help put an end to type 1 diabetes (T1D) by participating in the JDRF One Walk! Join Channel 13’s Jeriann Ritter and Ed Wilson: Date: Saturday, May 11, 2019 Time: Check in at 8 AM – Walk starts at 10 AM New Location: Des Moines Area Community College (DMACC) Ankeny Campus …"
"DMACC is the only college or university in Iowa and the entire Midwest to offer Court Reporting. The DMACC Newton Campus will be hosting an …"
"Nathan Vonname is majoring in ag science and animal science studies at Des Moines Area Community College (DMACC) in Ankeny. …"
"Moving forward with Rhone’s plan has an advantage, Chapé said, for the city and its continued partnership with Des Moines Area Community College, which owns the collection of Maytag buildings known as Legacy Plaza. In favor of a solution, Chapé liked the “workflow efficiencies” created from the park shop conversion and is also concerned of the safety of staff in the event of a tornado, stating that she prays it will not happen. …"
"Talent on the gridiron combined with race is the focus of a Tuesday presentation at Des Moines Area Community College (DMACC). …"
"The other groups partnering in the project are Des Moines Area Community College and Iowa State University. …"
"Grau is a former state FFA officer and is now a student at Des Moines Area Community College. The daughter of Shannon Grau-Quail and the late Gordon Grau of Newell also plans to attend ISU in the fall and study agriculture and life science education. Her plan is to teach high school ag education. …"